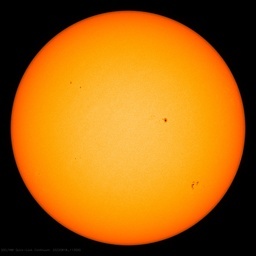 The sun is blank – welcome to the solar minimum | Watts Up With That? No I’m not asking you to fill in the blank, but I am asking you to notice that at this time, there are no sunspots on the sun at all. This piucture above shows the face of the sun for St Patricks day. Contrast this to just a few weeks ago, when sunspot 930 (shown below) erupted with a massive X class solar flare, the largest in years. It just goes to show you how volatile our sun is and how small we are in the face oif its massive energy. You can check www.spaceweather.com for details on the current state of the sun, the solar wind, and the geomagnetic field. Wow, great picture there at the end. I’ve long thought that the “global warming” trend is all a bunch of hype from those who would rather blame the woes of the world on its inhabitants than actually spend any time trying to investigate actual cause. The more reading I do on the subject the more I’m coming to realize what you’ve stated in this blog; this is just a cycle, one that the Earth has gone through many times and will go through many more times before we all evaporate into space. Try to explain that to E.L.F. though. Guess it’s easier to be ignorant. You sure are hard to keep up with Mr. Watts, thanks for an informative and active blog. By the way, what is the syntax for posting a named link so that only the link name shows up and not a lengthy address? I tried [URL=link address]Link Name[/URL] but it doesn’t work.